(Sorry that these are out of order, I had this one scheduled to be published months ago and for some reason it never published, and today when I tried publishing it, it wouldn’t work, so I’m starting all over with this post). Today we are talking food and food shopping and properly handling those foods. I have heard it told that in America we throw away an average of 50% of our food….whether we are cooking too much/serving too much/restaurant portion sizes are too large, OR we buy the food and don’t use it and it ends up being tossed in the trash. That is a LOT OF MONEY that is being wasted by the average American. I am also guilty of this, but not to this level. I am definitely one that will make something or buy something and put it in the fridge and forget about it. Since the last time that I heard this statistic, I have been more mindful of inspecting the deep dark crevices of both fridges every day…yes EVERY DAY to make sure I haven’t missed anything! If I have something that is about to turn, I will incorporate it into a meal that day….even if it is something that won’t be eaten right away, I can freeze that dish or eat it within a day or two. OR if it is a vegetable or herb or something along those lines, I will prep it and get it into the freezer (ie if I find an onion that has an outer layer of skin that is beginning to get soft, I will peel that layer off and shop the onion and get it into the freezer)…..if it is an herb I will either dry it in the sun or in the oven on VERY VERY low heat with the door propped open periodically to keep it from baking, or I’ll make a sauce or pesto with it. Fruit gets cut up and frozen for desserts, muffins/breads or smoothies. Leftovers get eaten right away or remade into something else. Another manner of waste is something that I really deal with in my home….since moving almost 18 months ago, I have noticed that we generally only fill 1 1/2-2 kitchen trash bags per week, and half of that (if not more) is fruit and veggie waste. If I had a compost pile, we would have virtually no trash, but to be VERY VERY VERY honest, the whole composting thing scares me. I don’t want (and i know all of the arguments) pests (flies, ants, roaches, etc) and rodents (mice, rats, etc) and smell (I know, I know….if done properly no pests, no rodents, no smell…..BUT it would be MY house that that wouldn’t be the case). If we had chickens, we would have virtually no trash (our yard is not conducive to chicken, but I also have a dog that I’m afraid would want to play with the chickens and in her overzealousness would kill them….she’s accidentally killed a couple of doves in trying to play with them). BUT we don’t have compost or chickens and our city doesn’t allow food waste to go into the green waste can with yard clippings, SO we have probably 1 full bag each week of peels, egg shells, tops, bottoms, etc of our produce. Well, this summer I have tried to remember to save some of those things for making stocks and jellies. Peach pits and skins, and plum pits, and apple peels and cores (and I’m sure pears too) all can be cooked down with water and strained and made into jelly. Carrot peels, onion peels, tops and bottoms of onions, carrots, celery, mushroom stems, broccoli stems, herb stems, etc, can all be used for stocks and broths. SO I have a bag in my freezer for all of my veggie scraps to use in my broth and stock making, as well as a bag of peach and plum peels and pits to make another batch of “mixed fruit” jelly. Watermelon rinds can be made into watermelon rind pickles, and even if you don’t can, they will be good in the refrigerator for a couple of months. Meat bones….so many people just toss their bones from all of their meats out without giving it another thought, and if you were to look in their pantry they have boxes and boxes or cans and cans of processed chicken, beef, ham, etc broth. They could have had FREE broth instead of spending all of that money! If you don’t have time to put the bones (and the veggie scraps from your freezer….or a carrot, an onion and 2 stalks of celery) with some salt and pepper and cover with water into the crockpot and cook for 12-24 hours, then put the bones into the freezer until you do have time. if you want an even richer broth and you have bones that were not already roasted with the meat on them, roast them. Also add a splash of vinegar into the water to help draw the calcium and other nutrients out of the bones. You can freeze (or if you have a pressure CANNER you can bottle) the broth. Another sense of food waste is bread items, what do you do with the ends of your loaves of bread? In our house, they get used in sandwiches by the adults. But if the kids use the last 2 regular slices and leave an end….what to do with those? PLEASE do not throw them out! Let them dry on your counter top or in the oven for a few hours, (or toast them in the toaster or oven until dry) and crush them into bread crumbs. Or put them into the freezer for later use for fresh bread crumbs or even feeding the ducks the next time you go to the park. If you have single slices that are too dry for a sandwich, why not cut them into cubes and dress lightly with olive oil, garlic, dried basil and toast to make croutons for salad. If you have bits and pieces of meals leftover, not enough for a full serving of anything for a single person, SAVE IT. Some of the VERY VERY best soups that I have ever made were made from a bucket of scraps of leftovers that I had in the freezer. For a season in my life, I had an ice cream bucket in the freezer that every bit of leftovers (yes, EVERY BIT….pasta with sauce, rice, lasagna, meats, veggies, mac & cheese, mashed potatoes, etc, etc, etc….that wasn’t enough for a meal for our family, it went into the freezer). When the bucket was full, I’d put it into my soup pot, add chicken broth, and let it cook. I know that it does not sound appetizing, but it IS! Those soups were DELICIOUS and not anything that could ever be replicated. One of the soups that I made from my bucket had macaroni & cheese, spaghetti wtih meat sauce, tri-tip, ham, fried chicken, peas, corn, green beans, cheesy mashed potatoes, broccoli, cauliflower, carrots, spinach (leftover from a spinach salad with dressing on it), turkey breast, rice pilaf, and few other things that I don’t remember. I know that it sounds gross, but HONESTLY it was DELICIOUS! Those are some of my ideas on how to save money by eliminating food waste…..what do you do in your home? This week I’ve been seeing posts by MANY of my facebook friends that their children, husbands, wives, and selves have gone back to college or started college this week. Not only is college expensive for tuition and fees, but books are INSANELY expensive. When I was a college student 25+ years ago I bought as many books as I could in USED condition and was able to save some money, but in that day and age, the only option for purchasing most of your text books were the college bookstore. If you had prof’s that were using novels or non-fiction biographies, you could sometimes borrow those from the city/county or school library for free, or get them for less money at used book stores, or even stores like Walden’s Books or other bookstores (Sadly, I don’t even remember the name of the bookstore that I frequented the most in high school, college, and in my early married years). Today though, college students can save SO MUCH MONEY on books, there are so many great options out there. Here is what I do now for my kids’ college books…. Step #2–talk to students that have taken the class from the same instructor, OR email the instructor, OR wait until the first day of school to make sure that that particular instructor uses the books, or if you can get away with only purchasing the online code, or maybe you can share a book with another student? Step #3–If you find that you DO need the book(s) listed for each class look up the book on the following sites noting how much the book is new, used, as a rental and as an e-book (a spreadsheet comes in VERY HANDY for this process). The fastest and easiest way to do this is by searching by using the ISBN number. We have found that with many of the text books we can do rentals, or e-books for MUCH cheaper than even buying used. However there have been classes that we’ve been able to get a used book for just a couple of bucks. I do have friends and family that have gotten textbooks from craigslist, and freecycle, but I just struggle with dealing with some of these individuals sometimes….I prefer doing a little more legwork and having them delivered to my home. OH! Another great way to get books is by talking to your friends or people that you know that have taken the classes and buying or borrowing from them. We have been able to get free or just about free books this way. We have found also that some instructors will give the college book store a “bundle”….which usually means a text book and the online code for homework/labwork, etc. So far, our experience has been that EVERYONE of these online codes has included an online version of the book, and by only purchasing the online code and not the bundle has saved us an average of $50 per class. ALSO, some of these codes will work for multiple semesters….for instance, if you are taking 3 semesters of spanish, the code may work for all 3 semesters. Same with math, and possibly some lab sciences that are in the same science family. Another “trap” with the bundle deals is that oftentimes a prof will have the bookstore bundle a text with supplementary books that you can either borrow from the library, get for free as e-books (ie kindle/nook….neither of which you have to have a special device for, you can use your mobile device or computer or tablet), or very inexpensively in used bookstores/thriftstores or from amazon. Don’t feel like you HAVE to have the textbook for taking notes in, etc…..the kindle/nook/electronic versions almost always have the capability of highlighting and note taking and will save you a BUNDLE! And last but not least, if you are renting textbooks, MAKE SURE YOU RETURN THEM ONTIME! You will waste the money you saved if you have to pay for a 2nd rental period or if you end up getting charged for the book because you waited WAY too long to return them. If you find during the semester that it is a book that you actually wish you had purchased instead of rented, all online stores do offer this option to you at anytime during your rental (and they deduct the amount that you have already paid for the rental). This past week has been filled with remembering back to what I was doing during this week 13 years ago…..I was anticipating the arrival of my brand new Bosch Universal Kitchen Center (the heavy duty mixer that can EASILY knead up to 10 pounds of whole grain bread dough (6 loaves) effortlessly, and a few doctor’s appointments, celebrating the birth of our closest friends’ youngest child….also a daughter. And of course, awaiting (not so very patiently I might add) the birth of the caboose to our family train. In early January of 2000 I went in for my annual physical and left finding out that I was 7 weeks pregnant. I had had no idea that I was pregnant until that time! For the first of my pregnancies I had not had one single symptom! I hadn’t been sick, I hadn’t been sore, I hadn’t been overly tired….nothing! If they hadn’t done an ultrasound that day to show me the baby, I don’t think that I would have believed them (I had ALWAYS known before even the pregnancy test could test positive when I was pregnant). We had just found out about a month earlier that our closest friends were going to be having a baby in August, and now I found out that we also were going to be having a baby that was due on August 15. (Our friends were due August 11–if I remember correctly). This was the first time that my friend and I had been pregnant together….we were BEYOND excited!!!! Well, needless to say, when the nurse told me I was expecting another baby, I was shocked….SO VERY VERY VERY HAPPY, but shocked!!!! And I could only imagine what my hubby was going to say….so what does any woman in her right mind that just found out that she is 7 weeks pregnant do? She calls her husband at work, right? 🙂 I still remember what I said too….and his reaction 🙂 “Honey, what are you doing August 15?” “I DON”T KNOW?????”……. “Well, how about we have a baby?” …… silence….. “Have a what?”….. Yes, honey, we have been blessed with another baby! The conversation went on briefly from there, but the nurses were all giggling while I made this call 🙂 (one of the nurses had been a friend from elementary and Jr High…..she was so glad she got to share this moment with me, as was I :)). SO, fast forward through a not so long and very normal pregnancy (my first by the way….hadn’t realized how much my high blood pressure and borderline high blood pressure with my 3 previous pregnancies had affected all of the other parts of the pregnancy) to August…..in early August during my pre-natal check up the OB detected a slightly irregular heartbeat in our little baby. He said that he didn’t believe it was anything to be concerned about, but he wanted me to come in for non-stress tests 3 days a week until the baby was born to keep an eye on the babies heart and heart beat. So, August 15 rolls around (our due date), and we had an appt that morning, so we go in, hoping to find out that baby would be coming very soon (this precious baby had done something that none of my others had ever done….she had dropped into position and while making my breathing much easier, it necessitating the need to use the restroom much more often). Nope, no contractions, nothing going on to indicate that this baby would be arriving anytime in the next day or two. Now here is where I became distressed….our oldest two babes were born on their due dates…..H (our 2nd born daughter, 3rd born baby) was induced due to complications and was born at 37 weeks. So I had never gone past that “magical date” before! Got home and found out that my friend was in labor…..but I wasn’t! So, our “niece” was born on August 15, 2000 (our baby’s due date)…..we were so very excited for our friends, but had to start the waiting game for our own little bundle. Several more doctors appointments, and a very tired and worn out and HOT mommy and 7 days later we finally got the doctor to agree to induce labor …..the next day! So, on Wednesday, August 23rd we were scheduled for induction. Without sharing the next several hours with you, let’s just say that our little bundle of joy (which we had chosen to keep the identity of his/her gender a surprise for the birth….with our others we knew what they were before they were born) was very happy where she was at, or maybe just wanted to be born on a Thursday like her 2 previous siblings. But at 1:02 am on Thursday August 24, my husband and I welcomed our daughter, Rachel Elizabeth into the world. Our 3rd daughter, our 4th child, and the caboose to our family train! Anyhow, the caboose to our family train is a blessing to all that meet her. She has a very tender heart, a warm smile and the biggest warmest hug that you could ever ask for. She loves the Lord, she loves her family and her friends, and is INCREDIBLY loyal! She is a great daughter, an awesome (although sometimes pesky) younger sister, a granddaughter that makes her grandparents immensely proud, and a friend that will love you through any disagreement or issue that may arise. Happy 13th Birthday precious girl!!!! Mommy loves you and am blessed to have you as the caboose to our family train! This week’s installment is regarding your utilities. If you have read my blog for any length of time, you know that just over a year ago we moved to a newer, larger home with a pool…..our forever home! We love it here and it is a home that my honey and I can grow old in together 🙂 One of the big shocks when we moved here was that our electricity bills were so much higher than our family that we are buying the home from. Anyhow, our first full month here, we didn’t have to run the a/c and our bill was $282. And the next couple of months went up from there! We did find a few ways to cut back on the useage a little bit but nothing significant. We just resigned ourselves to high electric bills. Fast forward to either September or October, and the electric company put a smart meter on our house. I had been very resistant to having it because of the controversy surrounding them regarding super high bills, electrical magnetic fields, etc, etc. Let me tell you, this past 3 months, (once the smart meter went completely accessible online with our account with our electric company) being able to see our hourly useage day to day, I have gotten our electrical bills down in the $160s! 2 months in a row now have been in the $160s. Here’s what I have noticed…..
2. Our desk top computer (even though it is an energy star rated computer) still uses a LOT of electricity. I can also tell you when the computer is on by looking at the hourly useage. This and the lights are our biggest changes, and it has saved us an average of $70 per month!!!!! 3. Unplug anything that isn’t currently running. I walked around the house, went room by room, and found no less than 15 outlets that were being used by something that rarely gets turned on! 5. Use alternatives as much as possible. If your stove is electric, and you have a gas grill, use it for cooking as much as possible (even the bottled propane is cheaper ….at least where I live…. than the cost of electricity for the amount of cooking that I do). If you have a lot of outdoor lighting in your yard, consider switching as much of that as possible over to solar lights. We have both our front and back yards lit (not bright lighting, but path lighting) with solar lights, and once you are out in it, they do offer nice ambiance lighting…..eventually we would love to add some stringlights that are solar powered to a couple of the trees. 6. For water savings, use timers for showers. Turn the faucet off when you are lathering your hands or brushing your teeth. Don’t run the water constantly while washing dishes. Fill your sink, and don’t turn the water back on until it is time to rinse out the sink. 7. 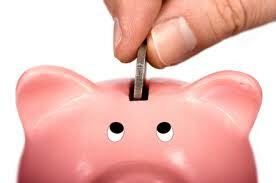 Check with your gas, electric, water, sewer, phone, cable, etc companies and see where they can offer you savings. Oftentimes there are discount plans or tiered plans or cheaper plans that can save you a bundle. I recently called our satellite tv company because our initial introductory period was up, and our bill had gone up by $35 a month…..I was able to get them to discount it by another $15 for another year. So by making a simple 15 minute phone call I saved us $240 this year! Same thing with our internet, our introductory period ended, and the bill was going to go up another 8.01 per month. I called to see if there was a lesser rate, they extended the introductory price, so I saved us another $192.24 over the course of the next two years with a simple 5 minute phone call. We have gone to wireless home phone service, and only pay $25 a month, if we were to have the exact same services provided by the phone company (or even bundled with our internet or satellite) it would cost us a minimum of $49 plus taxes per month. So we are saving $300 a year by using the wireless home phone service (it is offered through Sprint….I’m sure other wireless providers offer it as well, we just found out about it when we were looking at a new cell phone for me last year). Remember when I posted this a few days ago? Well, I didn’t ever post the end results of this particular part of that yummy meal. I just had a friend on Facebook ask for homemade salsa recipes, so I’m going to share my recipes. Both of my recipes are VERY versatile and can be used with roasted veggies, raw veggies, even canned tomatoes and canned tomatillos. Wash and dry tomatillos, jalapenos and poblano peppers (do not cut either type of peppers). Lightly drizzle with oil (I use olive oil), and season with salt and pepper. 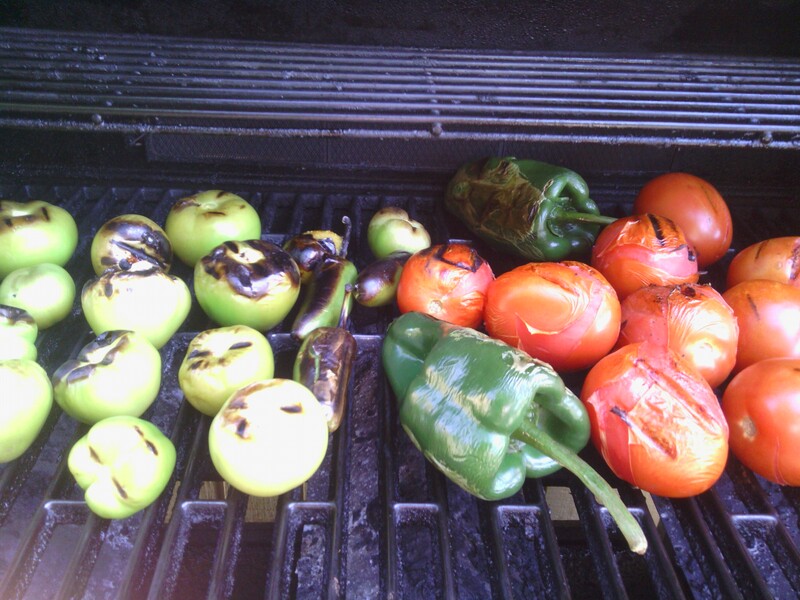 Put on HOT grill (or on a sheet pan in a HOT (400 degrees) oven) and roast until the skin on the tomatillos and chiles are well blistered and dark in color (yes, you want them to have a good amount of black on them), turning midway through the process so that the whole fruits get the color. Remove from grill and let cool. Once cooled, remove stem and seeds from poblano, and seeds from jalapeno if desired. Place all ingredients in food processor or blender and pulse until everything is finely chopped. Adjust seasoning as necessary. Refrigerate for several hours before serving (at least 30 minutes, but the longer the better). Wash and dry tomatoes and jalapenos. Lightly drizzle with oil (I use olive oil), and season with salt and pepper. Put on HOT grill (or on a sheet pan in a HOT (400 degrees) oven) and roast until the skin on the tomatoes and chiles are well blistered and dark in color (yes, you want them to have a good amount of black on them), turning midway through the process so that the whole fruits get the color. Remove from grill and let cool. Once cooled, remove stem (and seeds if desired) from jalapeno. Place all ingredients in food processor or blender and pulse until everything is finely chopped. Adjust seasoning as necessary. Refrigerate for several hours before serving (at least 30 minutes, but the longer the better). I mentioned above that you can leave the veggies all raw, you may need to adjust the seasoning with lime juice and salt if you do this. Also, if you use canned tomatillos or canned diced tomatoes, you will want to drain the cans and you will use a little more lime and may need to adjust the salt a little more. I find that after 6-8 hours you can no longer tell that the salsas made from canned tomatoes/tomatillos taste canned. The flavors all blend together, and you can no longer tell that they were processed. You can also use canned or pickled jalapenos if that is what you have on hand. Something that I have struggled with kind of all of my life, but most especially the past 12 years is being afraid of being abandoned by those who are never supposed to abandon me. You see, I have been abandoned by 2 parents, one through his direct (extremely abusive) actions that led to a very nasty divorce and my mom taking my brother and I and moving to another state and not letting anyone know where we had moved (this was done out of fear). And then many many years later my mom simply walked out of my, my husbands and my childrens’ lives without a word. Still don’t know what caused it, but the Lord has wonderfully and beautifully healed me. BUT I still sometimes struggle with the fear of being abandoned by my family. 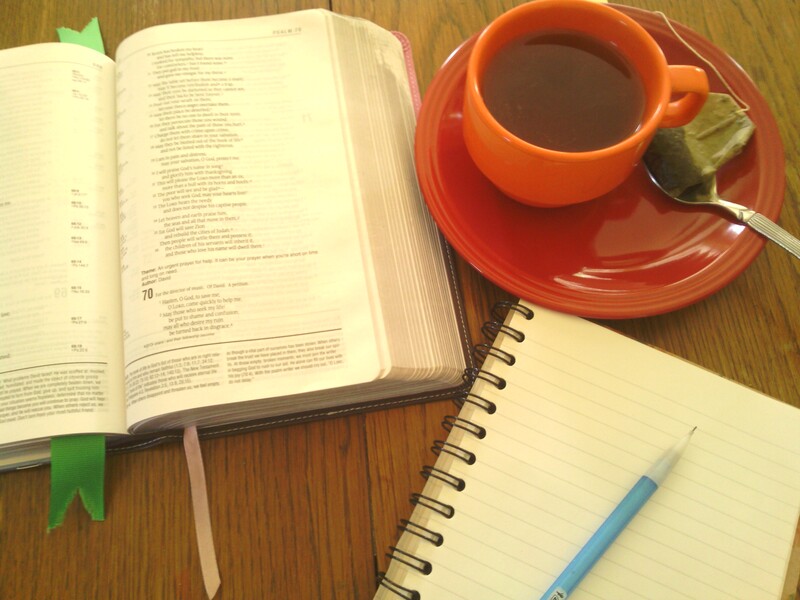 It is those times that I cling to God’s promises that He will NEVER leave me nor forsake me. I have known for years about this promise in the New Testament, but was blessed beyond measure to find it in the old testament this morning! Isaiah 49:13-16 Sing for joy, O heavens! Rejoice, O earth! Burst into song, O mountains! For the LORD has comforted His people and will have compassion on them in their suffering. Yet Jerusalem says, “The LORD has deserted us; the Lord has forgotten us.” “Never! Can a mother forget her nursing child? Can she feel no love for the child she has borne? But even if that were possible, I would no forget you! See I have written your name on the palms of My hands. Always in My mind is a picture of Jerusalem’s walls in ruins. I was blessed to find this gem this morning…..I have read Isaiah dozens of times before, but never really noticed this passage before. God is so faithful to show me these things just when I need them! THANK YOU LORD!